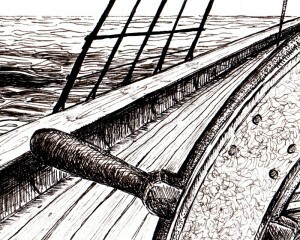 Welcome to part three of Water Lines – Pen & ink – a virtual tour of artworks I recently showed in a group exhibition at the Studio Gallery (Gosford Regional Gallery) in December. 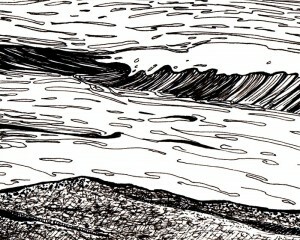 Inspired by a love of the ocean, waves and ships, my drawings seek to describe and hopefully inspire. 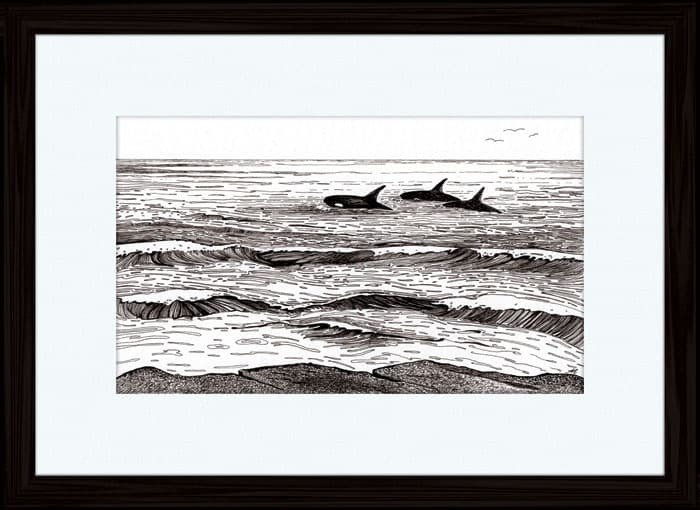 The Ocean is home to Orcas, providing vast, almost ever-reaching expanses of water to live, journey and play. These majestic and beautiful creatures should be free to travel the world with their pod. No Orca should ever be confined to a miniature-sized tank where humans come to gawk, when you learn how far they travel and how intelligent and social they are – captivity seems unbearably cruel. 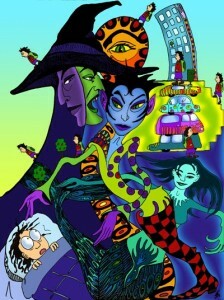 Years ago I had a dream, which has stayed with me. I was on the beach with my then toddler-age daughter playing at the water’s edge. Suddenly, an Orca came straight towards us – he was enormous, and I was worried that my little girl would be harmed … typically, she wasn’t wasn’t scared, but ran to greet this new big friend. 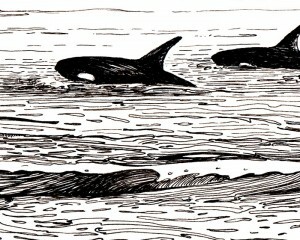 The Orca, which by now was almost on the beach, urged us onto his back. We climbed up and he turned around and swam out to sea. At first I was worried that if he dived we wouldn’t be able to breathe, but then somehow my fear disappeared – I realised that he meant no harm. We went on a journey together where he showed us his home and his friends in the deep blue sea. We moved through the water at powerful speed and felt completely safe and happy in his care – it was beautiful. 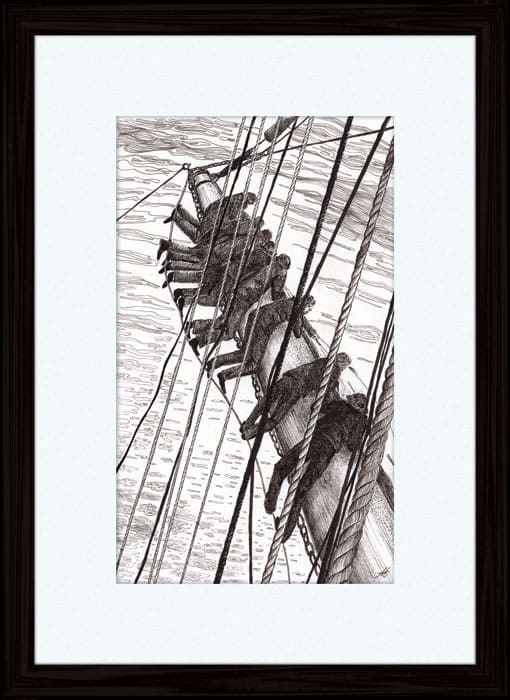 Inspired by the infamous Cape Horn and stories passed down from my great grandfather Carl, who sailed around the ‘Horn’, this drawing tells of the sheer drop and treacherous conditions working up masts in windy weather… Seamen climbing up and down the masts without a safety harness in sight. There isn’t a photo of Carl up the mast, so I went through of old books and found photos of other sailors, the most striking one taken by A. J. Villiers, (an Australian adventurer, mariner and photographer) on a journey around Cape Horn. The photographs and stories allowed me to imagine and depict what it would have felt like to be (up) there. 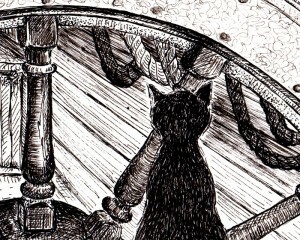 Ship’s cats have long played an important role at sea. In helping to keep rats and other rodents at bay, some cats even had their name recorded in the official log (as a member of the crew). 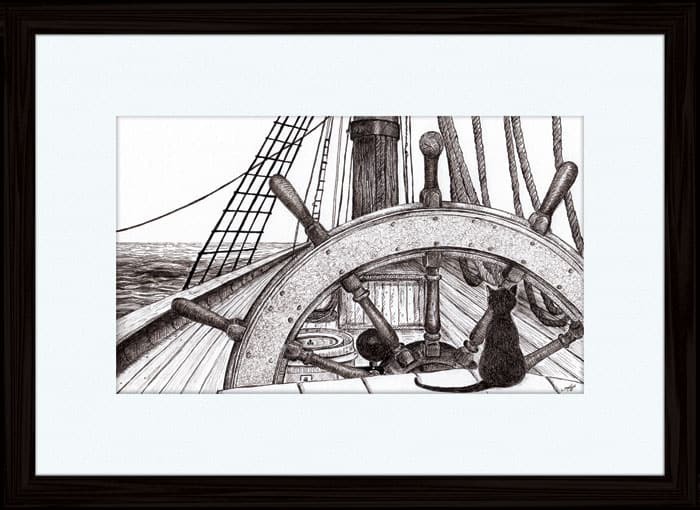 This drawing celebrates the role of the Ship’s Cat, borrowing inspiration from a very close friend of mine: Filemon – the brave. You are making a clear point here about the Orca’s and I fully agree, Annette. While I love taking my kids to the Zoo, I cannot help but think about the situation these animals are in. From time to time this has led to interesting discussions at the dinner table afterwards. Note to self: The good dreams are the ones to remember. I can imagine cats taking their job very seriously when it came to keeping “their” ship free of rats and other small creatures. Your previous post with relation to refugees has put me in a pensive mode. It makes me sad that people do not seem to learn from history. So many people have had to live in fear and eventually lost their life due to what other people did. And this just keeps going on and on today. I agree with Johan about remembering good dreams and (insinuated) forgetting all the others. 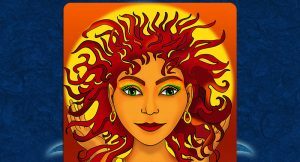 Dreams can be important signposts – I do not believe that they are to be taken literally, but they often contain information and suggestions that, if understood properly, can help us live better lives. 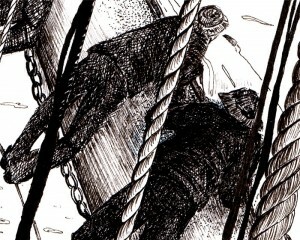 There is no way that I would have been able to climb up and down masts – I am almost hysterical when I reach the second rung of a ladder… Your drawing beautifully captures the danger involved in unfurling the sails. I can imagine that Filemon is very proud, being chosen to portray all the feline sea-goers. No doubt he will soon be looking for a ship to captain.